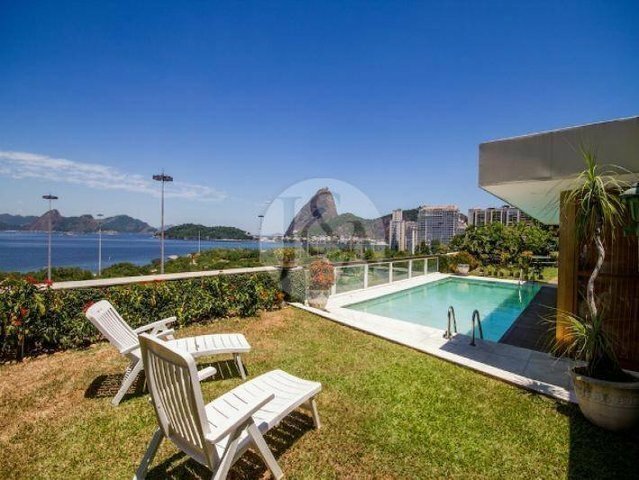 Magnificent one-of-a-kind penthouse with three huge stories offers a large marbled pool (with a heating system for the winter time) on the top floor, along with beautiful and well-kept gardens and the most incredible views of the city, facing the Guanabara Bay to the front and the famous Sugar Loaf Mountain to the right. With a total of 40,903 sq ft, all floors are interconnected with a private elevator that goes directly from its private entrance to the building, which includes marble floors, a vestibule, a coat room and an office space.There is also a one bedroom apartment for a live-in doorman. The top floor is divided into two distinct areas: the area facing the pool and the stunning views has a living/dining area and a bar/lounge area with a kitchen. Next to the kitchen there is a full bathroom for staff use only. There is a marble restroom in between the dining and lounge areas. The pool area also counts with a full bathroom for guests. Across from the garden, a charming structure that looks like a house on top of a building offers a larger dining area with its built-in barbecue facility, a living/game room, dry and wet saunas with massage/fitness room with a separate shower area, dressing room and restroom. The whole structure is surrounded by greenery and a path that allows you to go into it through different doors. The 2nd floor faces the water and its ceiling is equivalent to two floors. Its includes a dining table that can accommodate up to 24 seats, a winter gardem with a marble fountain, a parlour room for the ladies which connects to a large living room with a grand-piano, a breathtaking library/smoking room for the gentlemen and a guest room. Connecting all these rooms therer is a stunning long hall with marble floors that also functions as a gallery for the display of several pieces of art. At the back of the floor, we have yet a butler's pantry, an informal dining area, a large kitchen and a full staff dining area with a full bathroom. The first floor has four suites, two of them have a separate dressing room and walk-in closets. There are two enclosed verandahs, a large living room and another grand hall/gallery connecting all the rooms. In the back are two rooms that currently serve as laundry facilities and bad, bath and beyond storage, and two additional bedrooms for live-in staff. This top apartment complex and its building was built by renowned and extremely wealthy Guinle Family in the 40's, in the Neoclassic French Style. This same family built The Copacabana Palace Hotel, the Palace of the Government and other landmarks around the city. Also right in front of the building one can enjoy long walks in a huge park designed by internationally acclaimed landscape designer Roberto Burle Marx, and the beachright in front of it. A bike path that starts in Barra da Tijuca, bordering almost all Rio's entire shore line and its white sandy beaches, crosses through the park all the way until the oldest part of city. The old docks that are now being revamped and soon to become another magnificent complex, that will be called Marvelous Port, with parks, museums, restaurants and many outdoors entertainment. An heliport and the city's domestic airport are located 10 to 15 minutes drive, making it extremely convenient to get in and out of town without ever worry about traffic. Underground private garage to up to 10 cars, with a wine cellar and a storage room.